What can you do when Outlook won’t connect to a new mailbox no matter what you try? Long time Office Watch reader, Phil, found himself with an especially stubborn Outlook which would not connect to his new mailbox. He’s changed Office 365 mail servers so had to reconnect Outlook to the new mailboxes for him and his wife. All went on OK on his partners computer and Phil’s own laptop. There was no question that the login details (to Microsoft’s own servers) were correct. Outlook on his desktop computer refused to connect to the mailbox. As usual the Outlook error messages where vague to the point of being useless like “Something has gone wrong” and “you’ll need to consult your network administrator””. Doesn’t tell the user anything. It’s even less help when you’re the ‘network administrator’. The typical Microsoft advice is no use, mostly because the ‘help’ assumes the user has the wrong connection information. These problems and advice apply to all Outlook for Windows way back for a decade or more. We’ve seen Outlook problems like this for as long as we can remember. What’s an Outlook user to do? Here’s the next steps to try which amount to making Outlook forget or bypass whatever setting is causing trouble. Outlook connection settings are in Profiles. Too often, profiles get messed up and Outlook can’t cope, resulting in those vague errors we mentioned earlier. This can happen when adding another mailbox or sometimes to an existing profile for no obvious reason. Profiles are somewhat hidden in Outlook. They are intended to let people use Outlook with different connection settings. 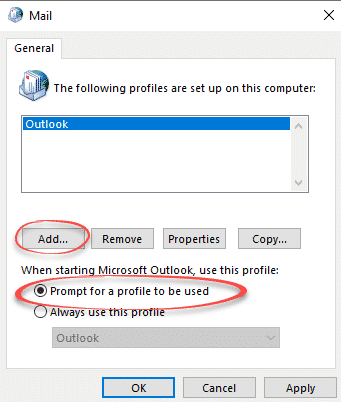 Try setting up the mailbox connection from a new Outlook profile. Go to Control Panel | Mail. In Outlook 2016 for Mac, Profiles are managed in the Outlook Profile Manager. Then ‘Show Profiles’ to see the Profiles dialog. Click Add to setup connections to Outlook. That will open the usual ‘New Account’ wizard in Outlook. ‘Prompt for a profile to be used’ is important to choose. When Outlook starts you’ll see a dialog to choose the Profile. Hopefully, Outlook will connect to the mailbox with the newly created Profile. If not, more drastic measures are necessary. At worst, erase Outlook and Office from the computer, remove old Outlook settings then reinstall the software. It’s an extreme measure which goes beyond just uninstall then reinstall. Move the contents of the hidden folder Users\<user name>\AppData\Local\Microsoft\Outlook to another folder (or just a sub-folder) for safekeeping. Start Outlook and try setting up the mailbox/connection again. Phil had to do that long-winded process to get Outlook working again.